Rated: (includes perils of nature and sexual situations). 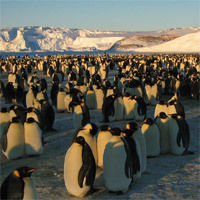 During a recent episode of "Ebert & Roeper," Richard Roeper, quite accurately, described "March of the Penguins" as a documentary that does not differentiate itself from the myriad similar programs found any night of the week on the National Geographic channel. Because of this, he argued, he could not recommend the film; it wasn't that he disliked it so much as he couldn't recommend someone pay ten bucks for what they can get for free at home. Roeper might be on to something with this viewpoint, but his job was to review the movie rather than the cost of a pricey theater ticket. Indeed, "March of the Penguins" doesn't win points for breaking new ground, isn't particularly challenging, and could just as easily be viewed in the comfort of one's home once it reaches DVD and cable without losing much in the way of possible big-screen grandeur. Nevertheless, it is a motion picture worth seeing, its depiction of a year in the life of emperor penguins staying captivating and always informative within a quick 80-minute timeframe. Narrated by Morgan Freeman (who, coincidentally, also narrates the currently in-release "War of the Worlds"), filmmaker Luc Jacquet travels to Antarctica, a snowy, icy, barren landscape that on a good day reaches fifty degrees below zero. These dangerously low temperatures have made it impossible for most life to survive here, save for the emperor penguin species, flightless birds who travel seventy miles by foot each winter to convene at a mating spot. Their sole goal is to find a partner and produce an offspring. 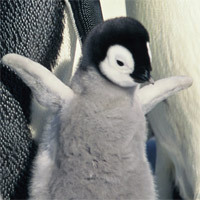 With rapidly decreasing temperatures and spine-tingling winds that sometimes get up to 100mph, this is a tricky, often deadly, proposition, both for the parents, who must stay and keep the eggs warm, and for their eventual chicks, who quickly freeze if not successfully shielded from the cold. "March of the Penguins" is an exactingly woven documentary that is also a fairly thorough education lesson on the lives of penguins. While the consistency of a single landscapea giant white mass of ice and snowholds the film back from reaching the aesthetically wondrous heights of 2003's bird documentary "Winged Migration," it is more detailed and informative because it is all about one type of bird rather than a whole lot of different species. Further aiding this mission is a superbly performed running narration by Morgan Freeman, whose voice is on hand enough to give the viewer much-appreciated information, but not so much that it detracts from the visual storytelling. The penguins' story is an amazing one, as they, by nature, risk their lives and put such a stake in having babies, only to return to sea in the spring and never see their children again. 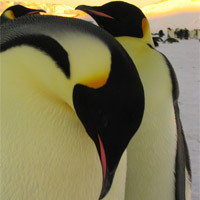 The efforts in capturing the footage seen in "March of the Penguins" must have been difficult and daunting, to say the least, and director Luc Jacquet does a fine job of making it feel like there are no cameras present and we as an audience are seeing this process of life first-hand and up close. 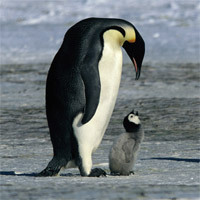 For a G-rated movie, "March of the Penguins" contains a mating sequence so intimate and beautiful and personal that it is almost uncomfortable to watch, and also quite a few casualties brought on by ocean life and environmental circumstances. Because of the latter, younger children in love with the cute and cuddly penguins may be disturbed by the harsh views of nature at their most fatalistic. If they can work through these scenes, however, they may be just an entertained as adults, and get a valuable learning experience out of it, as well. "March of the Penguins" leaves some questions unansweredwhy do the penguins endure such a tough climate when it takes so many of their lives? How can they recognize the voices of their family members after being gone for so long?but, if anything, the film might inspire the viewer to do further research on penguins after the fact and find the answers to these overlooked queries. "March of the Penguins" is a loving portrait of a gorgeous, awkward creature that, in some ways, is remarkably similar to human beings, and in other ways couldn't be further from us. That it ultimately doesn't leave a more lasting emotional impression is more a flaw of the decision to release such a simplistic story theatrically than it is of the film's actual content.